RPC-040-A in its powered down state. Containment Protocols: RPC-040-A is to be kept in a standard high-value item container, alongside RPC-040-B and RPC-040-C in Sector-C, west wing of Site-002. RPC-040 instances must be stored in a cushioned briefcase separate from others when not use in testing. Maintenance of RPC-040 instances is to be undertaken biweekly by authorized personnel with security clearance of Level 2 or higher. The chamber in which the PRC-040 instances are being maintained must be cleared of any electrical outlets. Testing with RPC-040 requires the approval by of less than 2 personnel with security clearance of Level 3 or higher. Any testing chamber(s) used must be cleared of any organic tissue prior to testing and RPC-040-A's light to be positioned against RPC-040-C for the duration of the testing. In accordance with procedures put in place following Incident 040-A (see Addendum 040-01), all generated instances of RPC-040-1 must be terminated immediately following testing by pressing the "KILL" button located at the top right-hand corner of RPC-040-B. Description: RPC-040 is a collective designation of RPC-040-A through RPC-040-C instances. 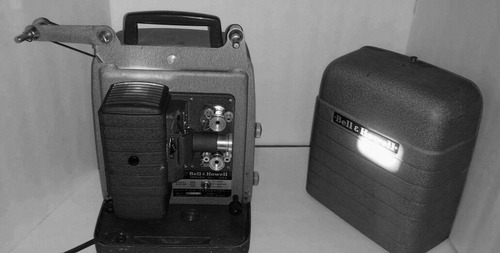 RPC-040-A is a brown Bell Howell 253AR Monterey Deluxe Projector with slight wear on the exterior. The anomalous properties of RPC-040-A only manifest when powered on. All matter (with the exception of gaseous matter) that comes into contact with RPC-040-A's light will dematerialize (rate of dematerialization depending on the object's mass). RPC-040-B is a remote controller virtually identical to its factory model, albeit possessing a different set of buttons used to control RPC-040-1. RPC-040-C is a projector screen that negates RPC-040-A's anomalous properties and prevents the surrounding area from being dematerialized. All objects lack an identifiable serial number. After 97% of the object's mass has dematerialized, a projection of the former object (now designated RPC-040-1) will emerge in its place; seemingly transparent with a gray monotone. Sentient instances of RPC-040-1 are capable of interacting with their surrounding environment, but cannot act outside of RPC-040-B commands when the device is used. RPC-040-1 instances are able to operate for extended periods of time and far from the vicinity of RPC-040-A (observed to be up to 8 hours and 1.6 kilometers respectively). All of the RPC-040 instances were recovered in ██/██/195█ from a suburban home in the city of [REDACTED], ██ after multiple reported sightings of so-called "ghosts" by several concerned locals prompted an official investigation. Instances of RPC-040-1 were seen exiting the house of ████ █████. The owner of RPC-040 instances was terminated after repeatedly refusing to cooperate with the Authority. Below is a list of experiment logs detailing tests of both RPC-040-A and RPC-040-B conducted by Head Researcher Garnett and his research team dated ██/██/195█. Result: A projection of the Jasmine flower was produced with a gray monotone, designated RPC-040-1. None of RPC-040-B's commands, excluding the "KILL" command, elicited any response. Upon pressing the button labeled "KILL, the instance of RPC-040-1 vanished instantaneously. Result: Object reacted with pain. A projection was produced, also with gray monotone. Pressed "JUMP" button on RPC-040-B. Object jumped 0.8 meters. Result: RPC-040-B 's "JUMP" button was pressed while pointed in the direction opposite that to the location of RPC-040-A. RPC-040-1 was non-responsive. Result: RPC-040-B's "JUMP" button was pressed while aluminum foil obstructed the radio transmitter. RPC-040-1 was nonresponsive. Result: RPC-040-B's buttons labeled "UP", "DOWN", "LEFT", and "RIGHT" were pressed in sequential order. RPC-040-1 performed all actions as expected. Result: Researcher █████ used the movement commands to take RPC-040-1 to Site-002's hangar and back. RPC-040-1 is left in the testing chamber with no input to RPC-040-B for 8 hours. Result: Upon pressing RPC-040-B's button labeled [DATA EXPUNGED], RPC-040-1 immediately attacked Researcher ███████; "KILL" command was executed in response. Testing concluded. During a containment breach dated ██/██/195█, Archivist Janet Neuman entered the RPC-040 testing chamber seemingly trying to hide instead of evacuating the premises. Archivist Neuman ran into RPC-040-A's light after the research team evacuated the testing chamber and left RPC-040-A powered on unattended. The resulting instance of RPC-040-1 was later designated RPC-049. All surviving research team working on RPC-040 has been met with disciplinary action for neglectful behavior.